Last week, we shared our 4 favorite ways to include our furry friends in all the holiday fun. This week, we’re shifting gears to the nitty gritty: how to keep them safe. Because while it’s important they’re included in the festivities, it’s even more important they stay out of harm’s way! Growing up, my family cat, Pepe, was obsessed with the Christmas tree. And every year, he would attempt to climb it, causing a dangerous mess as glass ornaments came crashing down (not to mention himself). A lifesaver? The adjustable wooden gate we fastened in front of the tree so that the cat (and dog) couldn’t get to it. Not only did it prevent tree-crashing accidents or broken ornaments, it kept the pets from drinking any Christmas tree water, which is advised against due to the preservatives, pesticides, and fertilizers used to keep the tree fresh. Yes, the Holly is pretty hanging around the house, and lilies make a great centerpiece. But Holly can lead to diarrhea and vomiting when ingested by a dog, and lilies can cause kidney failure in cats. Poinsettia, too, can be toxic to both cats and dogs. A word to the wise: keep holiday plants at a minimum, and if you must decorate, keep them contained in a bouquet. Candles are key for setting that festive, warm feeling during the holidays, but they can be hazardous to curious pets. Make sure you only keep them burning while you’re in the room, and out of reach to any kitties who may be tempted by the light. 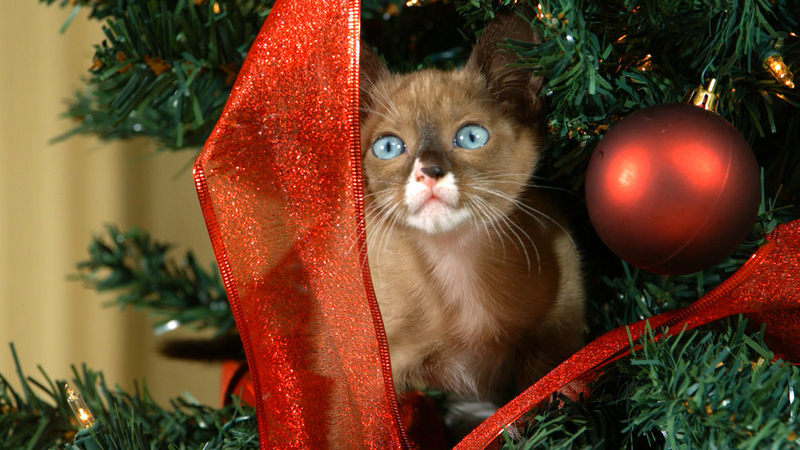 Same goes for any hanging lights or tinsel around the house – cats especially will want to play with sparkly things that catch their eye. Be careful! Sure, sneaking food scraps to your pet may be part of the holiday tradition, and we aren’t here to stop you. But we strongly advice checking out this list of essential holiday no-no’s to feed your pet. And make sure your kitchen garbage is securely fastened, especially when it smells extra tempting over the holidays! Our last tip? Amidst all the fun, we recommend including as much of your regular routine as possible. This will keep your pet feeling happy and secure, especially if you have guests visiting or parties planned. Don’t have time to fit in your regular walk? Pampered Pets offers the care you expect for your pet when you don’t have the time yourself – that means long walks, personalized play time and lots of attention.